What a whirlwind of a month! My husband + I traveled around the Pacific North West for a couple of weeks and it truly was everything you've seen in photos. I can hardly wait to show you all of our travels! But for now I am too giddy to keep these photos for myself. Nathan contacted me a couple of weeks ago about taking photos of him proposing to his girlfriend Katelyn! 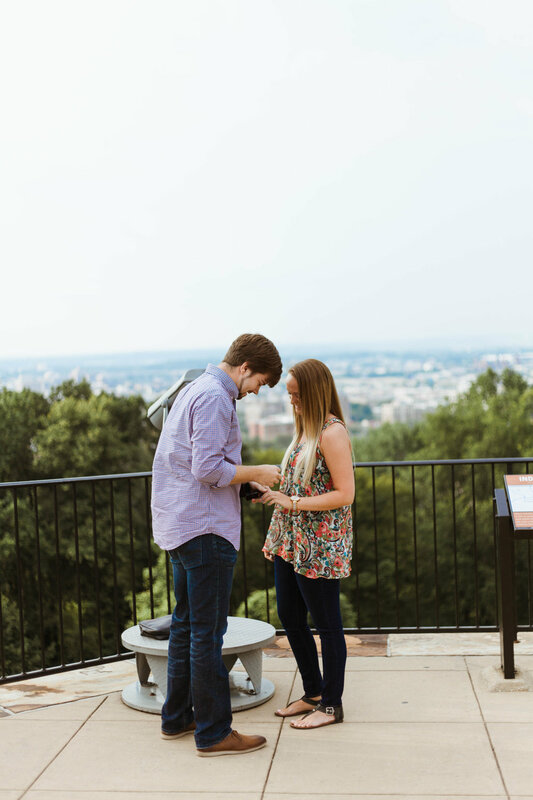 The proposal was taken at The Vulcan in Birmingham, AL -- a common spot they go on dates to view downtown Birmingham. Nathan had planned for Katelyn's friends to have a giant sign when she looked into one of the museum's telescope's that said, "Will You Marry Me?" -- i'm literally STILL swooning. My favorite part was because there are no places to hide at The Vulcan I pretended to take photos of my cutie husband while I was actually taking photos of them. It ended in lots of beautiful tears and a photoshoot documenting her new beaaaautiful bling. Congratulations Nathan + Katelyn! h a p p y w e d n e s d a y, frans!